So writes Cam Hui (http://humblestudentofthemarkets.blogspot.ca) in edited excerpts from his original article* entitled Correction? Watch The Cyclicals!. Regular readers know that I have been cautious on stocks lately. The market action last week is best characterized as volatile and sloppy. 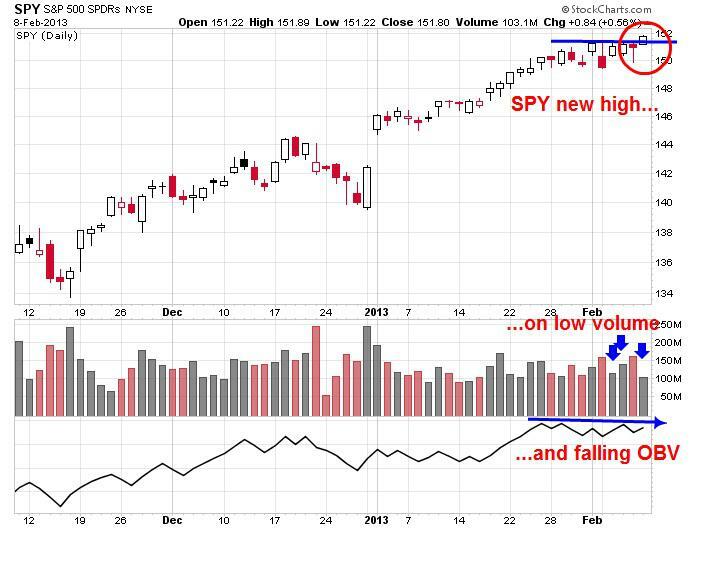 The new high achieved on SPY on Friday was accomplished on low volume and a non-confirmation on On Balance Volume (OBV) [as seen in the chart below so,] at this point, any call for a correction is at best conjecture. I am watching the relative action of the cyclical stocks to see if a correction has truly begun. The chart below of the relative return of the Morgan Stanley Cyclical Index (CYC) against the market illustrates my point. CYC remains in a relative uptrend and it has pulled back to test the relative uptrend line – but I cannot call it a technical breakdown. Similarly, the relative performance of the Consumer Discretionary stocks (XLY) against the market as a measure of the risk-on trade shows that this sector remains in a solid relative uptrend. Should the market correct, the relative uptrend line is likely to be broken. Globally, the South Korean economy is known to be highly cyclical and the KOSPI is used as a measure of cyclicality. Currently, KOSPI is showing a pattern similar to the relative return of CYC to SPX – a pullback to test the uptrend line – [as can be seen in the chart below]. It could be said, however, that since South Korea is a competitor to Japan in exporting capital goods to China, the recent JPY devaluation is creating headwinds for Korean stocks and the pullback may be reflective of those circumstances. 8. What Recovery? Contradictions Between Reality & Political Claims Are Everywhere! 9. Ignore Wall Street Cheerleaders: Market Technicals, Fundamentals & Other Info Says Otherwise! Next Commodities: How Big a Player Is Russia & How Best Can Its Strengths Be Played?